KERRY COUNTY BOARD chairman Tim Murphy has accepted that players who were omitted from Peter Keane’s 2019 Kingdom squad should have been informed of the decision by management. Kerins O’Rahillys delegate Dan Walsh raised the issue at a county board meeting on Monday night, with Murphy admitting “a few things fell through the cracks” in relation to contacting players who were deemed surplus to requirements. Former joint-captain Fionn Fitzgerald and established forward Barry John Keane were among those reportedly left out of Keane’s pre-season plans ahead of his first campaign in charge of Kerry. 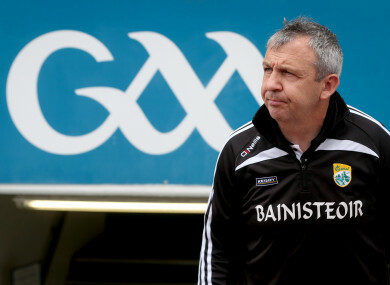 “I am expressing my clubs dissatisfaction at the new Kerry senior management in the way that Kerry players ( from last year’s squad) that were not called in by the Kerry management, were not even notified and it was remarked upon in a national paper as well last week,” said Walsh. “Some of the players have been involved with the Kerry senior squad for a long time and not even getting a text or phone call meant that they did not know whether they were in or they were out. “I think going forward for all Kerry teams, minor, U20, senior or whatever, because it’s a big commitment and every young footballer has aspirations of wearing a Kerry jersey there must be more respect shown to them. “We see from reports that there a number of Kerry senior players from last year not selected for 2019 but it’s the way they were treated and not communicated in a proper fashion that makes it paramount going forward that a system be put in place and they would be communicated with and told what was happening rather than being left in limbo. Murphy put it down to a breakdown in communication and confirmed the issue would be addressed. “I accept what you are saying,” he responded. “I know heretofore the senior manager and the management team were the people who were charged with calling in players or not. Email “Omitted Kerry players who were not informed by management 'fell through the cracks'”. Feedback on “Omitted Kerry players who were not informed by management 'fell through the cracks'”.